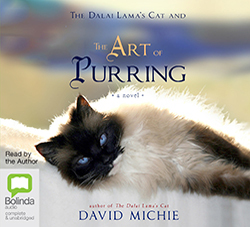 In this audiobook, the Dalai Lama sets for his lovable feline companion the task of investigating The Art of Purring. Whether it's the humorous insights gained from a visiting Ivy League Psychology Professor, the extraordinary research of a world-famous biologist, or the life-changing revelations of a mystical yogi, His Holiness's Cat encounters a wealth of wisdom about happiness. And what she discovers changes the way she sees herself forever. With a much loved and growing cast of characters from the local community and His Holiness's residence, as well as encounters with intriguing strangers and celebrities from far and wide, The Art of Purring will transport listeners in another unforgettable story. Along the way they will come to understand how elements of contemporary science and Buddhism converge. And, once again, they will feel the warmth of compassion and non-attachment that radiate from the heart of the Dalai Lama's teachings about our quest for enduring happiness.